Our company offers a wide range of quality personalised products from outdoor wear to bathroom accessories. If you are unsure about which gift to buy for a baby shower or christening, our personalised baby towels are a great solution. Not only are they unique but they’re also longer-lasting than buying clothes which babies soon outgrow. We sell a range of super-absorbent baby towels all made of 100% soft cotton which won’t irritate a baby’s delicate skin. Although our towels are available in traditional shades of pink or blue, we also have a variety of other attractive, gender-neutral colours. Towels can be purchased in monochrome or in white with contrasting colour trim. One of our most popular products is the hooded baby towel. 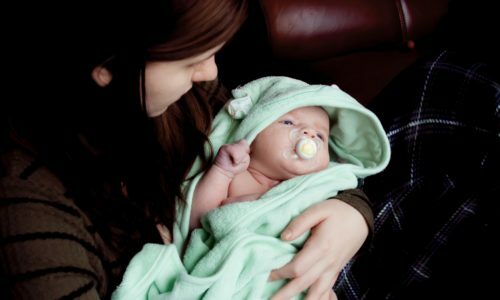 It acts like a baby wrap for a newborn, but can also be used as a towel as the child grows. The baby’s name, nickname or other personalised message is embroidered either on the hood itself or on a polyester border on the outside of the towel depending on the style of towel you select. We use classic Madeira embroidery threads so that the finished product looks stylish and is durable even after successive washes. Despite the challenges of customising a thick material like cotton terry towelling, our team have years of experience to ensure the finished product is perfect. All our merchandise is also submitted to rigorous quality controls including visual proofing. Because of the nature and demands of the embroidery process, we can only accept orders of at least 10 personalised towels. Our company shows its commitment to customer satisfaction from the moment you place your order. We offer a free graphic design service so you can choose the exact shade and font style you want on your personalised towels. We have a team of dedicated account managers who are always ready to assist you and welcome any queries you may have. Easy payment terms of 30-60 equal instalments are also available for the convenience of our customers. We are so convinced of the affordability of our merchandise that we invite customers to take advantage of our unique price beat promise. If you find a better quote for any of our products including our personalised towels, we promise to match the price on a like-for-like basis. Our quality products, excellent service and reasonable pricing, are all reasons why our company consistently receives a near-perfect score of 98% in customer reviews recommending our products to others.